The Mini Print International of Cadaqués is a print competition open to all printmaking techniques and tendencies, in which artists from all over the world participate. Information about the show is sent out each year to artists, print workshops, schools, universities and specialized media all over the world. The exhibition usually includes around 650 artists from some 50 countries of all the continents. The technical and formal quality of the works is very high. This has encouraged us to continue organizing the show year after year since 1981. In each call, a qualified jury makes a selection of six works (12 for the first years). 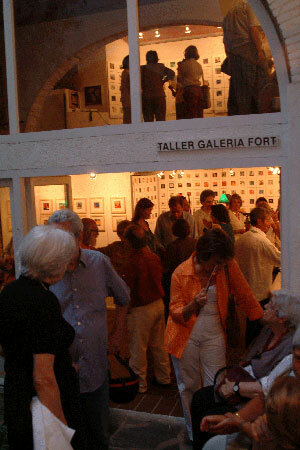 The award winning artists are invited to have a solo show the following summer in our Taller Galeria Fort in Cadaqués. Most of the winning artists attend the opening of their show and act as the jury of the Mini Print International of that year. The Mini Print has always had the ambition of showing the exhibition to the largest amount of public. The itineracy of the exhibition is very relevant and during these years it has travelled to various countries (United States, Japan, Korea, France, England, Ireland, Finland, Andorra, Mexico, Colombia, Spain, etc.) where it has achieved great success. Since 1995, the exhibition has been shown annually in L’Etangd’Art Gallery in Bages, France, and in the UK at the same time as in Cadaqués. In addition there are national and international shows which may take place sporadically. All these elements assure the continuity and success of this interesting and beautiful show of international graphic arts. The Mini Print International of Cadaqués is the most popular and longest running exhibition of miniprints in the world.